Boeing Corporation is closing its manufacturing facility for the C-17 Globemaster III, a large transport military airplane, in the City of Long Beach. During its peak, the C-17 facility employed up to 5,000 people, but since 2010 Boeing has steadily downsized the C-17 workforce. Though Boeing is closing the C-17 plant, the company is committed to a long-term presence in Long Beach because of its historical investment in the city and will continue to maintain a sizeable workforce in Long Beach on other projects. Numerous commercial and light industrial businesses near the site, ranging from restaurants to industry-related uses, were previously supported by the facility and its employees. These businesses have reported significant decline in activity and revenue and their viability is uncertain. 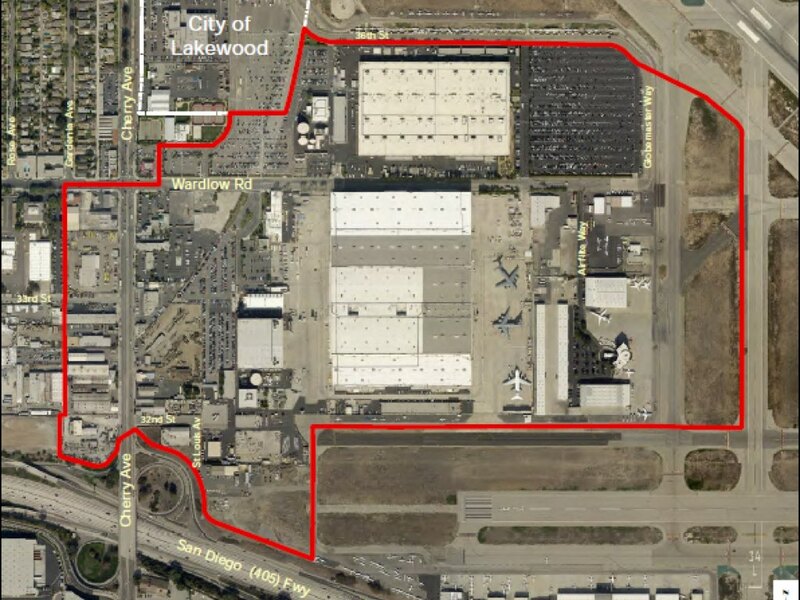 The total project study area is about 130 acres and includes: 1) the Boeing-owned C-17 site; 2) portions of the Long Beach airport leased/ used by Boeing; and 3) parcels around Cherry Avenue. The C-17 site consists of multiple parcels totaling about 85 acres, developed with approximately 1.1 million square-feet of enclosed production space (~25 acres), an adjacent building about half that size, a paint hanger, and associated buildings and grounds. The portions of Long Beach Airport and the area near Cherry Avenue comprise about 60 acres and 55 acres, respectively. The Boeing site is located next to and has direct access to the City-owned Long Beach Airport. The Port of Long Beach, the second busiest port in the U.S., moving $180 billion of goods annually, is eight miles away and also owned and operated by the City. 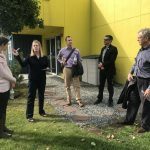 The site is also afforded direct access from Cherry Avenue onto the interstate freeway system. The City of Long Beach has locational advantages, with year-round moderate climate, access to a large and diverse workforce population, and global accessibility. With the resurgence of Long Beach’s diverse neighborhoods as residential destinations, the City has focused on facilitating reinvestment into and new development of our residential and commercial areas. The City has also made significant improvements to public infrastructure, including libraries, parks and recreation, and roadway/ bicycle infrastructure. The Boeing C-17 site and surrounding areas have an opportunity to complement these activities and be reinvented as an employment destination within the city. There are opportunities for improved connectivity between the project site and residential areas that offer new and attractive housing opportunities for new employees moving to the city. 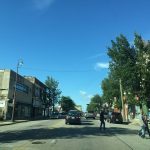 The City is seeking a development strategy for the site to be acquired, developed, or planned in a manner that could further the City’s vision of becoming a hub for emerging and innovation uses, with a focus on job retention and creation. This is important because the City does not own the Boeing facility or many of the surrounding parcels. Upon determining industries consistent with this vision, we will identify best practices on land use policies that will encourage those types of industries to locate at the site. We are open to studying the experiences of other cities on incentivizing uses in the vicinity of airports. Additionally, we would study ways to connect these industries to the numerous residential areas where skilled labor is available. Finally, the local Workforce Investment Board, Pacific Gateway, is a partner with the City and a key resource to leverage efforts to reuse the C-17 site and facilitate workforce development and training for new industry sectors that may be attracted to the site.